At its iPhone-centric event that saw the unveiling of the new iPhone X and iPhone 8 equipped with Qi wireless charging capabilities, Apple announced a new wireless charging accessory called "AirPower." Designed as a simple oval-shaped white charging mat, AirPower is able to charge the iPhone X and the iPhone 8 inductively. It also works with the Apple Watch Series 3 models and a new AirPods charging case that was briefly mentioned during the keynote. The new AirPods charging case is identical to the current case, with the exception of a new indicator light located on the outside of the body and the wireless charging capabilities. In addition to being able to charge through Apple's AirPower charging mat, the new iPhone X and the iPhone 8 will also be able to charge using Qi-based charging accessories. Apple will partner with companies like Mophie and Belkin to create iPhone-specific accessories, but all Qi chargers should work as event videos showed the iPhone charging in cafes and other locations. 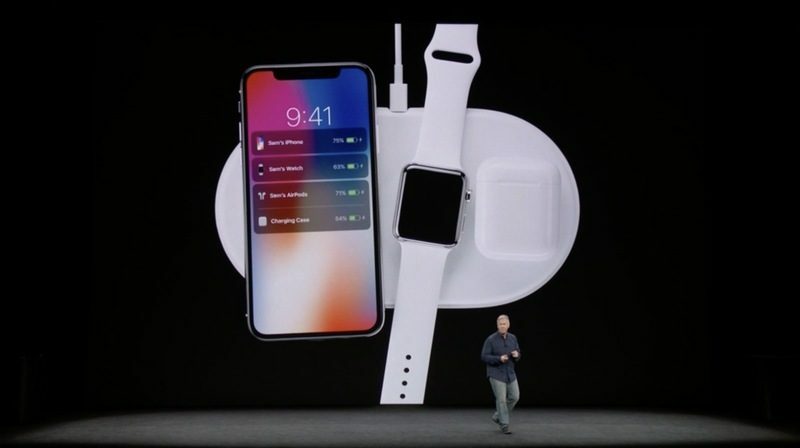 According to Apple, its AirPower charging mat uses a new kind of charging standard that is able to support multiple devices at once, so it won't be immediately available. Apple plans to ship the AirPower in 2018, but a more specific launch date hasn't been announced. Pricing is also unknown at this time. Where's the future wireless charging iPad gonna fit? This kind of "wireless" charging is a gimmick. With a wire plugged in to my phone (or tablet) I can use it at the same time as it charges. With such "wireless" charging I'm stuck to only charging or only using. I can't believe Apple actually decided to do this with their products... They used to be smart in the past. Now it's just market hype and to have feature parity with other brands, no matter how dumb a feature is. They weren't sure it was the best route at the time. They explored it and sadly the industry hasn't seen much innovation in that time. They didn't tout it as some world changing feature. Simply another added feature some may enjoy but the did seem to indicate they still weren't overly happy with the abilities, which is why it wasn't talked up much. I guarantee they're still looking into other options. People and companies change their mind. This was 5 years ago. I'm willing to bet there are things you feel differently about now than you did 5 years ago. Can I charge my iPhone while it’s in my wallet case, without frying my credit cards? so...is the airpods case standard on new airpods purchases or does everyone need to buy it separately? you mean you didn’t already fry your credit cards by buying the new iPhone? But they haven't taken that option away, you can still do that. so the larger wireless charging mats do not currently allow for charging of multiple devices? only Apple Air Power pad does? They exist, for up to 2 devices, but only for devices that take the same amount of wattage for charging. Or different placements on the mat, where a 2-device charger actually is 2 one-device chargers, and the devices must be placed on specific spots. I think most of them are 5W chargers right now. If you have a 5W device and a 2.5W device, they will both charge at the 2.5W level. I think maybe this charger is different? NOTE: I'm still trying to understand this myself, and Apple has given very few details.